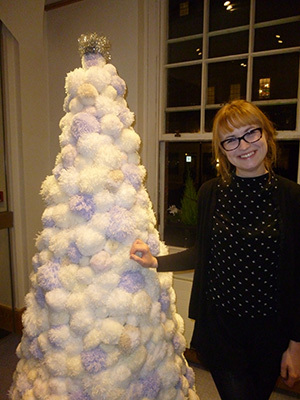 A quirky Christmas tree made of white wool pom-poms created by a Middlesex student has taken pride of place in the reception at a well-established central London law firm. 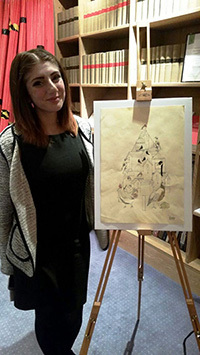 Illustration student Monika Petrovaite created the piece called 'Snowball Christmas Tree' after winning the commission from law firm Collyer Bristow LLP. The piece, which is made up of more than 500 pom-poms, consists solely of wool and wire mesh. The beautiful design was chosen by the Collyer Bristow Art Committee and curators Day and Gluckman from a variety of proposals from artists in the Middlesex illustration course. A second illustrator from Middlesex Ameena Qureshi also had her design selected for the Collyer Bristow Christmas card. Her charming 'Christmas Nest' design was sent out to Collyer Bristow's clients and friends worldwide. Collyer Bristow Partner Sarah Culshaw said: "Collyer Bristow is delighted to continue its support for new art and emerging artists by commissioning students to come up with the alternative tree design and also to further our longstanding relationship with the wider higher education sector." "The students at Middlesex produced a wide selection of strong and inventive proposals for us to choose from. Monika's tree of pom-poms has to be one of the most popular we've ever had, I've never known so many people want to stroke or hug a work of art! Ameena's illustration for the Christmas card is also delightful and has been extremely well received by our clients and friends," continued Sarah. Middlesex University student Monika Petrovaite (22) said: "I'm pleased that the tree is getting a good reception. It took more than a month and the help of other Illustration students to create it due to the number of pom-poms needed. Exhibiting at Collyer Bristow is a good opportunity for me to showcase my design to a wider audience." Illustrator of the Collyer Bristow Christmas card Ameena Qureshi (19) said: "I was really shocked, but happy when I found out that my design had been selected for the Christmas card. I'd worked hard on the piece, so it was great to have that recognised." The Collyer Bristow Gallery at the firm is also currently exhibiting art work by fine artists from Middlesex University and Goldsmiths, University of London, until the end of January 2015. Visitors can see this work and the 'Snowball Christmas Tree' at 4 Bedford Row, Holborn, London WC1R 4TF.